Christos Christou maintains his studio in the old city of Nicosia, Cyprus. Christou works sings lyricism with an intention to colour, mark making and self-expression. His works initially screams out angst and a gestural physicality of attacking a canvas but when we digest the work and look at it for a while, it becomes fluid, calm and serene. He is careful of the marks, the choice of colour and how the lines connect with each other. 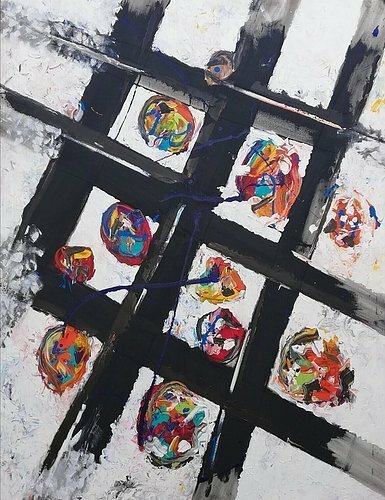 Christou manages his works with a formal quality of shape and Modernist composition which reflects an Abstract Expressionism following, but he has gone beyond this and attacked or rather collaborated with a surface where paint meets arm which meets emotion which meets ambiance. There are squares, ovals and circles. There are colours which remind us of a sunset, a couple falling in love through minimal ‘happy’ colours and gestures of free speech in street art. The physical application of paint suits Christou’s physique in its scale. The sensitive quality of marks made describes his free thinking and broad mindedness but most importantly his dominant shapes and colours shouts out that he is aware of how we can be suffocated by this overwhelming visual world we live in.